The Chamber of Commerce and Industry of Romania, the most important institution speaking on behalf of the Romanian business community, organized the 24th edition of the National Top of Companies Gala in Bucharest on Thursday, November 9, 2017. Antibiotice won the diploma and the “National Award” – first place in the category of “Industry – Very Large Business Enterprises. Manufacture of Basic Pharmaceutical Products”. 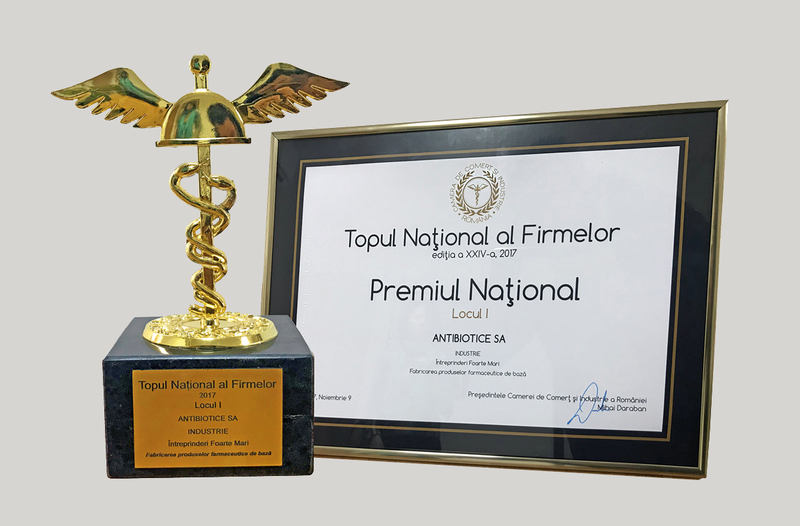 “We are proud to be recognized by the business community in Romania and honored for winning first place in the National Top of Companies. Such nice results confirm not only the professionalism and excellent work of our specialists, but also the healthy and sustainable evolution of the company, a 60-year evolution which demonstrates that Antibiotice is a powerful and viable partner both in the national business environment and in the international one”, said Ioan Nani, the general manager of Antibiotice SA. At this edition of the National Top of Companies, the first ten companies from 12,377 companies operating in different business sectors (i.e. industry, services, commerce, tourism, R&D and high-tech, agriculture, forestry and fishing, and constructions) were ranked. Recognized as a true barometer in the business environment, the Top National Companies was organized based on a complex ranking methodology which took into account the indicators achieved by the companies in the financial year 2016, i.e. net turnover, operating profit, efficiency of using the human resources and employed capital. Locally, in Top Companies from Iasi developed by the Chamber of Commerce and Industry if Iasi, Antibiotice ranked 1st and was awarded with the Excellence Diploma for winning the first prize for 10 consecutive years. One third of the turnover is achieved from the international sales.